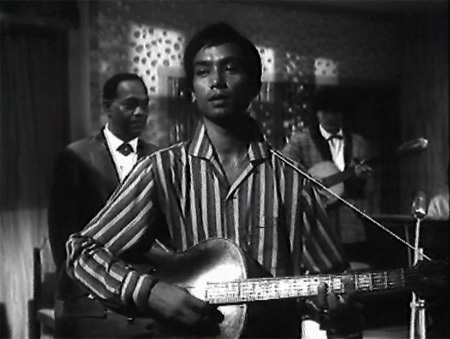 Lately I’ve had my iPod repeating a playlist that I put together of songs from 1960s films that are just bubbling over with western charm: guitars, trumpets, double basses, and the odd ukelele or two are used in what still remain quintessentially Hindi film songs. These are songs that have gotten stuck in my head time after time: I quite simply love them! It’s hard to pin down what makes them a collection, but picture doing the twist on a picnic with chums, or curled up with a martini on pleather space-age furniture in Daddy’s mansion. If I had to categorize them, I would probably settle on “Bollywood Lounge” although I’m not sure that quite covers it. I’m breaking with my usual practice of listing them in order of preference. Instead I’m listing them in the order that they appear on my playlist because I think they follow each other nicely this way (yes, I am a wannabe DJ). There are sixteen of them, perfect CD length (does anyone use those anymore?). 1. “Ajeeb Dastaan Hai Yeh” from Dil Apna Aur Preet Parai (1960) (sung by Lata, music by Shankar Jaikishan). Nurse Meena Kumari sings a song at a party celebrating the wedding of her surgeon colleague Raaj Kumar to Nadira. Although she’s in love with him herself, and shocked at his sudden marriage, she pulls it together with the support of her fellow nurses (including Shammi, love her!) and entertains with this Hawaiian-flavored ditty. 2. “Rut Jawan Jawan” from Aakhri Khat (1966) (sung by Bhupinder, music by Khaiyyam). Although this song is set in a night club, it has a much more lounge-y feel to it than an energetic Helen-style cabaret. Picturized on Bhupinder himself (v.v. handsome! ), who sings as Manvendra Chitnis talks to Naqi Jehan about her friend Rajesh Khanna’s need for her support as he searches frantically for his lost child. A perfect song in a near-perfect film. 3. “Halki Halki Sard Hawa” from Bombay Ka Chor (1962) (sung by Asha, music by Ravi). I can’t find any video for it, so am putting it here. Nor can I find my DVD of it (not at all surprising) so no screen shots either. Just enjoy the music! It’s a gem among many gems from this film’s soundtrack, one of Ravi’s very best (and that’s saying something!) in my opinion. 4. “Dilruba Dil Pe Tu” from Rajkumar (1964) (sung by Asha and Rafi, music by Shankar Jaikishan). 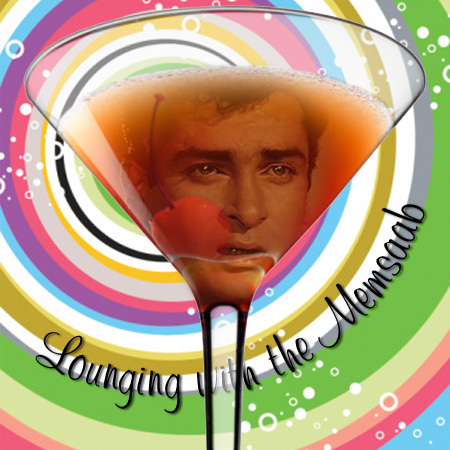 You didn’t think I’d leave Shammi off a list like this, did you? It would never happen. 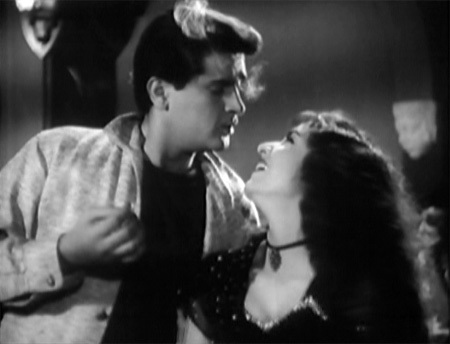 Sadhana and Shammi’s somewhat…umm…combative relationship turns to love. The peacock instruments don’t hurt at all either! 5. 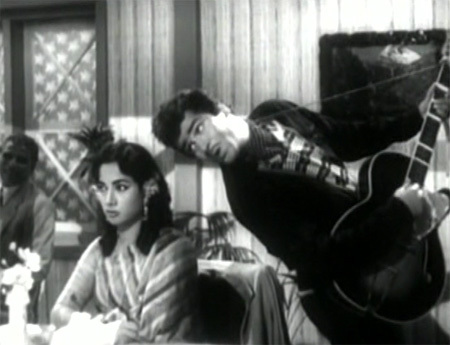 “Aage Bhi Jaane Na Tu” from Waqt (1965) (sung by Asha, music by Ravi). A lovely party gathering song, picturized on a gori by the name of Erica Lal (thanks bluelotus!). Raaj Kumar is hosting a party for visiting princess Shashikala, with plans to relieve her of her diamonds. It’s actually somewhat melancholy, but I love the melody and the instruments. 6. “Yeh Munh Aur Masoor Ki Daal” from Around The World (1967) (sung by Sharda and Mubarak Begum, music by Shankar Jaikishan). 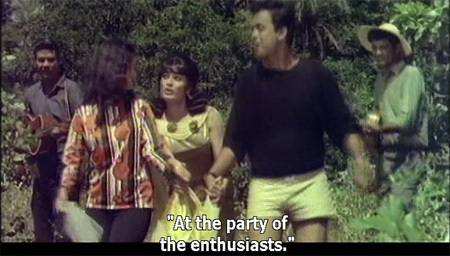 Rajshree and Ameeta (I think, although it’s hard to judge from the poor quality video and I haven’t seen the movie—want!) tease Raj Kapoor on a beach somewhere, surrounded by goras and goris and lots of sun and sand. Beach blanket bingo fun! 7. 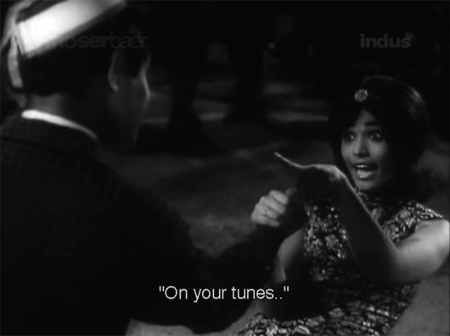 “Tune Jo Samjha” from Boxer (1965) (sung by Asha, music by Laxmikant Pyarelal). My favorite band Ted Lyons & His Cubs help Mumtaz shimmy her way through this one, along with backup dancers in matching fringed pants, as Dara Singh looks on. It just doesn’t get any better than this. 8. “Zindagi Se Pyar Karna” from Phool Aur Patthar (1966) (sung by Asha, music by Ravi). Ravi figures a lot on this list I have noticed! This song is pictured on Shashikala and a host of background dancers doing the Indian Twist that I love so. 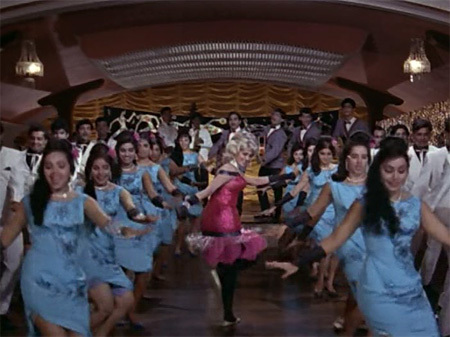 She is decked out in a blonde wig and pink sequinned dress with opaque black tights—a total “Fashion Don’t” even then! and she has one of those groovy lounge-lizardy bands. I defy you to sit still while you listen! 9. “Sawar De Jo Pyar Se” from Adventures Of Robinhood (1965) (sung by Rafi, music by GS Kohli). In another historically confused adventure tale, Robin Hood collects some Merry Men, beginning with Friar Tuck (Bhagwan) and a minstrel who sings this lively tune as the three bumble along into these very modern looking damsels, causing them some distress. 10. 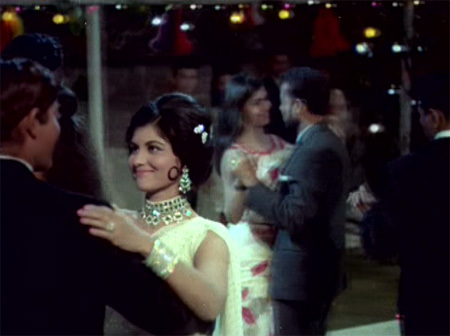 “Kisne Pukara Mujhe Main Aa Gayi” from Pyar Kiye Jaa (1966) (sung by Lata and Mahendra Kapoor, music by Laxmikant Pyarelal). So seductive, this song! 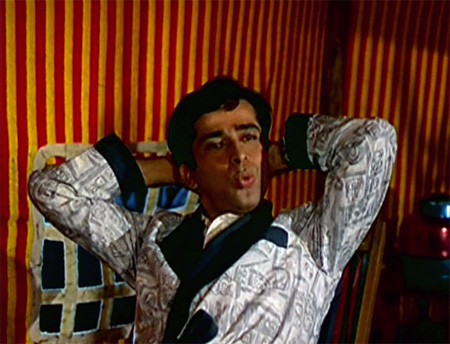 And who better as an object of seduction than Shashi Kapoor in a smoking jacket? 11. “Baar Baar Dekho” from Chinatown (1962) (sung by Rafi, music by Ravi). Shammi sang a lot of lovely western-inspired tunes, but this one melts my heart: all of his insouciant charm is on full display! Lucky Shakila! 12. 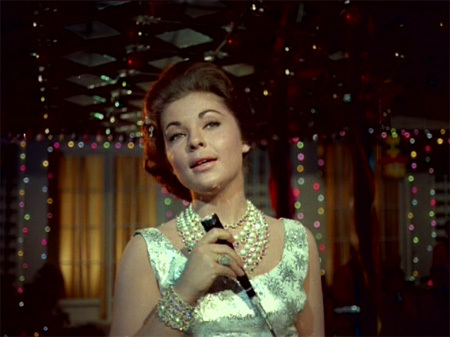 “Awara Aye Mere Dil” from Raat Aur Din (1967) (sung by Lata, music by Shankar Jaikishan). Lovely Laxmi Chhaya in one of her finest, bounciest songs, accompanied again by Ted Lyons & His Cubs. Love this film, love this song. 13. 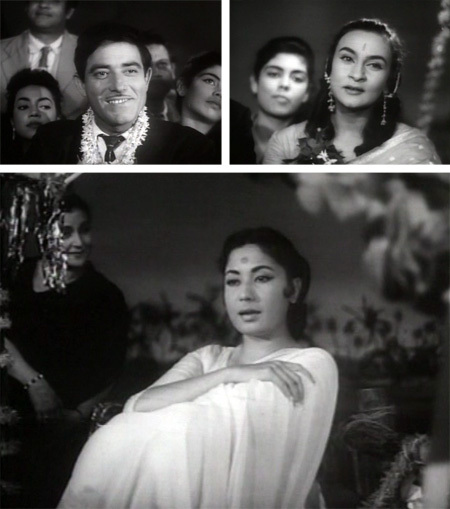 “Mehfil Mein Dilawon” from Mohabbat Zindagi Hai (1966) (sung by Asha and Mahendra Kapoor, music by OP Nayyar). Review coming soon! Rajshree celebrates with her friends when she finally inherits her fortune, something she had to marry Dharmendra—a prisoner on death row—to accomplish. I am sad not to find it online, because it’s a quintessential picnic-with-the-Twist song and the subtitles are made of awesome, but here’s the audio anyway. You don’t want to miss a party of the enthusiasts! 14. “Kisi Patthar Ki Murat Se” from Hamraaz (1967) (sung by Mahendra Kapoor, music by Ravi). We slow down a bit again with this lovely tune from Ravi. 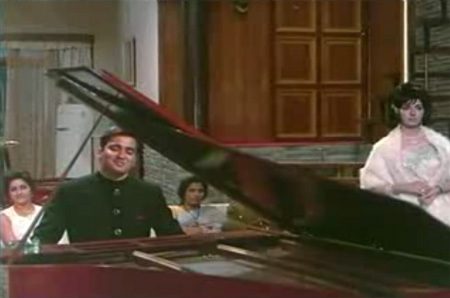 Sunil Dutt sings and plays the piano at a small gathering. I haven’t seen the film in a very very long time, and mostly only remember that all the songs are beautiful. 15. 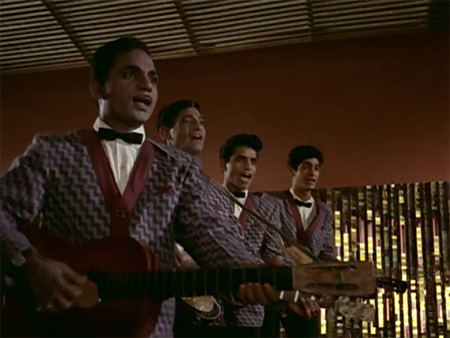 “Mehfil Mein Jo Aaye” from Vallah Kya Baat Hai (1962) (sung by Asha, music by Roshan). I’m not sure why every song from a lot of films are uploaded except the one I like! But it’s the case again with this one, so here it is for your listening pleasure. Couples swing-dance energetically as Shammi strolls through the crowd looking all cool with his turned up collar and his cig. 16. 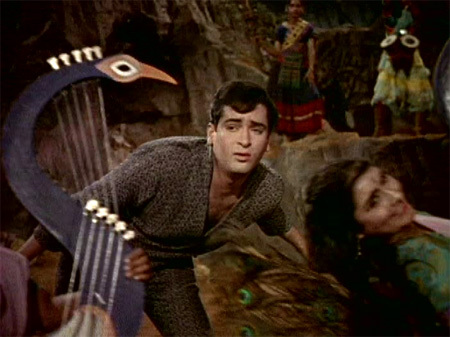 “Chik Chari” from Adventures of Robinhood (1965) (sung by Asha, music by GS Kohli). I know another song from this film is already here, but it’s a movie full of fun songs by a sadly underrated music director. And if anyone could tell me the name of this actress I will be so happy! I’ve seen her in several films, mostly standing around looking tall, slender and western! although I’m not sure if she is or not. Have a cocktail (or a mocktail if that’s your poison) and enjoy! Posted on October 13, 2009 at 4:16 pm in Hindi movies, Memsaab's lists, Yahoo! Shammi! | RSS feed You can skip to the end and leave a reply. You have made me a fan of ADVENTURES OF ROBINHOOD even before seeing the film. So that really was a ‘gori’ in Waqt and not Rakhi’s long lost sister … ?! She really does look like Raakhee, I thought the same thing. oh my goodness! LOVE the album cover!! I was bored and it was raining :) Of course, I could have been doing my actual job….nah. How about a review of Adventures of Robin Hood? Looks awesome. Two corrections: awara aye mere dil is by Lata and Chik Chari is by Asha. Thanks for the corrections—Asha and Lata sound the same to me a great deal of the time (sacrilege! I know!) especially if Lata is singing an “Asha-style” song (or vice versa). I had never heard this song from Dil Aur Mohabbat—it is beautiful :) I’ve already started a Vol. 2 playlist! “Dilruba Dil Pe Tu” from Rajkumar is one of my favorites! I adore that film (I even have a poster of it on my wall!). It’s one of my favorite Shammi films. You know I can die for Rut Jawan Jawan. Its such a perfect song. Some of these songs I havent heard, but all those that I have, are fabulous. Loving this list, its so eclectic and has some great influences, though I lovee me some “Aaj Kal Tere Mere Pyar” with the addictive dance moves that i recreate whenever i hear it. The gori mem in the Aage bhi song was sooo pretty and made me go out and buy a dress just like that! “Aaj Kal Tere Mere Pyar” will def. make the list of my favorite Mumtaz songs when I get around to it! And Erica Lal is gorgeous, I agree. Hooray for long picture-filled posts! The songs are quite “western-esque” at some parts but still managed to be very Indian. 5 – I wonder how gori is Erica Lal. Since her surname is ‘Lal’, I think she’s mixed-race. I wouldn’t have known that she’s gori if she dyed her hair completely black. As Atul said below, she married an Indian man, hence the last name Lal. Glad that I don’t have access to Indian television serials—I would hate “Ajeeb Dastan Hai Yeh” to be ruined for me! Indian televsion serials are addictive too. http://www.youtube.com/watch?v=KZPFqi1KQow#t=3m35s ARRRGH! What’s the full name of Erica Lal’s husband? For some reason, I don’t feel convinced. But then it is so nice to realise that there are so many great songs out there that are still remaining undiscovered by me. It means that one can never run out of “new” great songs to discover for a long long time. I noticed that the most frequent music directors on your list were Ravi and G S Kohl rather than the usual suspects. And that says a lot about the quality and versatility of these two music directors. Your list of “western” songs is from 1960s. If one prepares a list of ‘western” songs from 1940s and 1950s, then I think that C Ramchandra, O P Nayyar and Vinod will figure in that rather prominently. About Erica Lal, I think I read somewhere that she was an American who came to India and married an Indian gentleman called Mr Lal and that is the reason why she is called Erica Lal, and not because she was of mixed parentage. Atul, that’s the beauty of the interwebs and blogging :) I have discovered some great songs in your blog, glad I can return the favor a little. I agree with you on the 40s/50s MDs who would probably be more prominent if I picked western-influenced songs from those decades. And you are bilkul correct about Erica Lal. She married an Indian man. That song in Around the World was shot in Hawaii. Aparently Rajshri met her American husband on that shoot in Hawaii. I was wondering the other day watching Mohabbat Zindagi Hai what ever happened to Rajshree…so she married an American? Did she retire then and move here? She moved to LA and ran a clothing business for many years. I dont know what she does now. 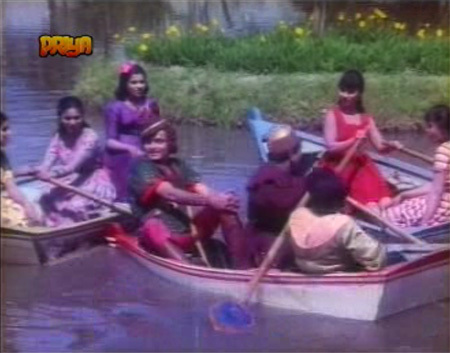 “Sawar De Jo Pyar Se” from Adventures Of Robinhood always reminds me of “Pukarta Chala Hoon Main” from Mere Sanam. Yes, it is similar (a little bit slower) :) And it’s another favorite of mine too! And humbling too – there are plenty of songs here that I have never heard of. Which is not a bad thing at all – it enriches my knowledge of songs. The ones I do know, I also like a lot. Like “ajeeb dastaan”, “kisi patthar ki moorat”, “dilruba dil pe tu” etc. What about “zindagi ittefaq hai” from Aadmi Aur Insaan ? I absolutely love this song – not only is Asha’s voice lilting, the picturisation (with Mumtaz, Feroz, Dharam) is superb too. Ha! I don’t have “Zindagi Ittefaq Hai” in this because it’s in a Mumtaz playlist which I will post one of these days. It is a FAB song. I’m shocked there doesn’t seem to be a You Tube link for “Bombshell Baby of Bombay” by “…the King of Rock and Roll–Iqbal Singh!” from “Ek Phool Char Kaante.” This was the title song of a fab cd compilation of rocking Hindi film songs that put many movies onto my To Watch list. Which fab cd compilation was this? Do tell what the other songs on it are??? I still use CDs (and sometimes even cassette tapes! ), Memsaab, and I would LOVE to have one with these songs – and that beautiful cover! It would be the perfect accompaniment to my next ‘party of enthusiasts’. These songs are almost all new to me, so it’s been great to discover to them – thanks for sharing your playlist. I am just about to get myself a new iPod, and they are defintely going on it. Good for you, DG! Wish I could come to one of your Parties of Enthusiasts! Actually, I did burn this to a CD so I could listen to it without being plugged into headphones or my computer :) Am working on Vol. 2 now. If I didnt already like each and every song on this list, I’d buy your CD for its priceless cover. And what is this about Dharmendra on death row? NAHIIIIN!!!! Please tell me it aint so, sooooon. Thanks, I’m glad you like it ;-) Yes, review coming soon. Quite a fun film it is! Rajshree married somebody called Greg Chapman in the 60s. There is a lot of information on him on the net. Here is alink to their picture. You need to scroll down on the page. Oh thanks! He is handsome and she looks beautiful. I”ll bet she’s aged well. I love the CD cover! Memsaab I was wondering if I may ask you an off topic question regarding a particular “how to” in India. Nice going, as usual , ma’am. Oooh, I remember that song… that’s an all-time classic. It reminds me a lot of some classical piece, possibly Mozart’s 40th. The ones on your list are fab too! “One Two Three Baby” from Kismat almost made it :) Thanks for those suggestions for Vol 2! Times Now had a special show about Rafi featuring sonu nigam, shammi and dev anand. Also the album art. What software did you use to create it?? Its so totally retro 60-ish ! Great job. I will come up with my suggestions soon. Thanks Harshi :) I used Adobe Photoshop and Illustrator for the type. Hm! Don’t have a single one of these. What’s a CD? What’s a CD indeed…your collection is mostly 70s, isn’t it? Perhaps you need to branch into the 60s a bit more :-D I would be in complete support of that. Congats and thank you! Being something of an encylopedia of 70s films (simply from having devoured so many films of that period, I just loved cinema, until a more refined cinematic taste developed), I’m delighted to discover this blog. Keep it up and all strength. Your post brought to mind another song, from the 70s, by Lata M, from the film Ek Mahal Ho Sapnon Ka. This is “Dil mein kisi ke pyar ka jalta hua diya”. I thought that song too had something of the quality some of your listed songs have. Oh, it does sound like these :) Very pretty song, thank you for putting it on my radar! I’m sad to say that I never developed a very refined taste, although certainly I have enjoyed some very good cinema from India :) And do chime in if you see mistakes or can answer questions, or just have trivia to add—I love that! Some kind soul heard your “fariyaad” and uploaded ‘Mehfil mein jo aaye tum” on You Tube. Both songs are in You Tube….. Believe it or not…..It is in You Tube…. 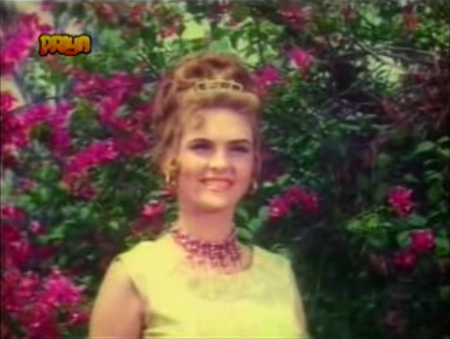 Another Shammi Kapoor and Rajashree film of 1968 Brahmachari has the following 2 songs….. The Following is with Mumtaz and Pran but from the same 1968 film “Brahmachari” – Aaj Kal Tere Pyar Ke – Again Twist type Dance and Music…..Good for listening as well as for watching…. Surely this one belongs in this list. Funky, groovy and all that. Brings back so many memories. I used to love this as a kid. Had no clue which movie and all that. Now I see it is from “Priya” (1970). A movie that also apparently had that other childhood favourite song of mine – “Na sun sun sun bura”. Okay, that is one of the best songs EVER. EVER in the HISTORY OF THE WORLD. Thank you Raja, I owe you one! What a wonderful song list. I made a playlist od them all. We already knew the first one, ajeeb . . . Please watch the video of my husband singing his version of ajeeb dastaan hai. We heard the song on a fabulous trip through S India. He was determined to learn it. He promised Khooshbu (who first taught it to us) and mesmerized us with it, that he would learn it and put it on YouTube. Check it out. He decided to sing it as a western ballad. I hope you like it and pass the link on. Oops, the link didn’t work; you will have to search Ajeeb Western on YouTube and it is the first video that comes up. You must know Gumnaam (?) a great song and dance scene; doesn’t exactly fit the list maybe, but boy does it get stuck in one’s head. Oh thanks for featuring the song Kisne Pukara Mujhe from Pyar Kiye Jaa. It’s a lovely song that I feel is under appreciated. My mom, who is the ultimate music lover, has made songs like Ajeeb Dastaan Hai Yeh and Aage Bhi Jaane Na Tu a part of my childhood although I was born nearly 20 years after the 60’s ended. Two of the best westernised songs!! I like Raat Akeli Hai from Jewel Thief. … And Aankon Mein Aanken Na Dalo from Tumse Achha Kaun Hai. How could I forget “Yeh Sama” from Jab Jab Phool Khile? Good combination of drums, strings and flute. It has Shashi Kapoor too!